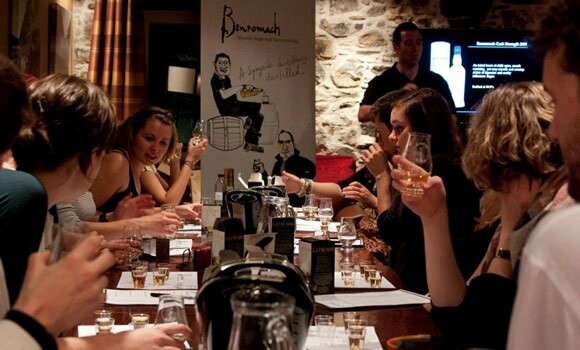 Demystifying the secrets of Scotland’s national drink with a leading industry expert. How is whisky made? What’s the difference between a malt and a blend? Why do whiskies vary between distilleries and areas? Why is the age of a whisky important? Should I dilute my whisky with water or ice? So many questions! Scottish whisky is an iconic international product and yet for many it’s secrets remain a black art. Our aim is to change this view, bringing a little knowledge, so that you can take on the 365 or so malts on our shelves with a renewed confidence. Our Masterclass evenings are held on several occasions throughout the year, usually in conjunction with our Beer Festivals. Join us for an evening with a whisky expert from leading Scottish whisky wholesalers Gordon & Macphail who has carefully selected a range of whiskies that will educate you, entertain you & hopefully leave you with a warm glow. Entry: £10 per person which includes your very own Clachaig Official Whisky Nosing Glass worth £6.95, not to mention the occasional taste of the good stuff. Masterclass starts at approx 8pm. Places are limited. Advance booking is highly recommended. Bottles of the featured whiskies will be available for sale on the night at a very competitive price compared to normal retail outlets. An excellent opportunity to not only try before you buy, but also to be able to bore your friends stupid with your intimate knowledge of the delicate flavours of your selected tipple!